Sienna Freeman, centre, is appearing as the young Princess Fiona in Shrek Junior – The Musical with Saoirse Gerrish as Donkey and Atiya Broadwood as Pinocchio. Based on the Academy Award-winning film and Broadway musical, Shrek leads a cast of fairytale misfits on an adventure to rescue Princess Fiona and find true acceptance. Part-romance and part-twisted fairytale, Shrek Junior is an irreverent show with a powerful message for both kids and adults. Sienna (11) plays three characters: the young Princess Fiona, Baby Bear and one of the Pied Piper’s rats. 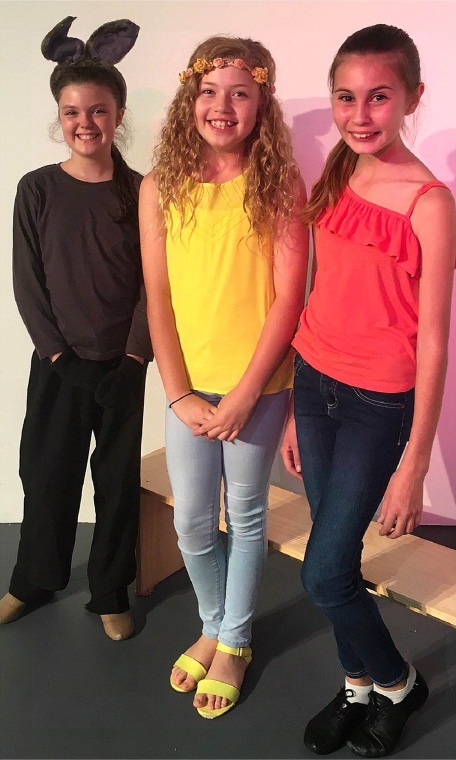 “I am super-excited about playing the young Fiona because I get to be part of a wonderful scene that shows the transition in age from Fiona as a child through to a teen, then to a young adult,” the Year 6 Spring Hill Primary School student said. “The character Baby Bear is very cute and gets to be in the fairytale creature scenes where I can sing, dance and act while, as one of the rats, I get to do some tap dancing, which I love. “Plus it’s Shrek and everyone knows and loves that story. Director Kristen Twynam-Perkins said the storyline follows the first Shrek film, as he fights to get his swamp back. “Shrek Junior is a shortened 60-minute version of the full-length production that premiered on Broadway in 2008,” she said. “The biggest difference is the musical numbers have been reduced in length.